at the west end of St. Thomas, Ontario. 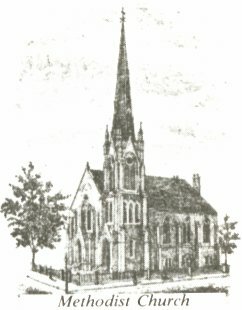 In 1834 a Methodist chapel was built on Stanley Street. 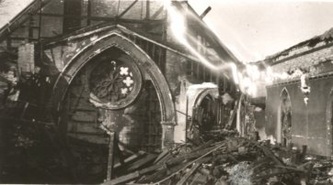 During the rebellion of 1837, this chapel was occupied by soldiers and some years later burned. In 1871, active efforts were made to build a new church. On March 30, 1873 when the building was completed at a contract price of $18,000.00, dedicatory services were held. The style of the church was semi-gothic, with a tower and spire on the southeast corner. The spire rose to a height of 132 feet. In the winter of 1876 a church bell was set up into the high tower. In the spring of 1878 a fine pipe organ was built into the south gallery. 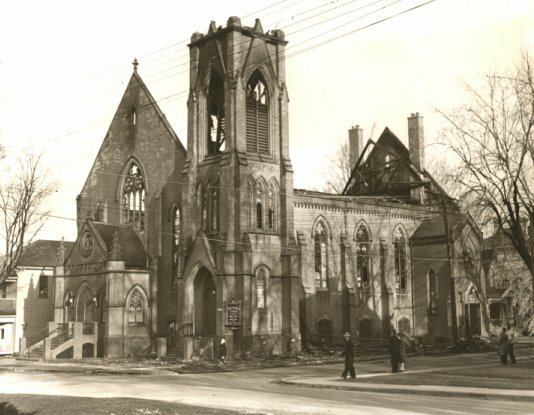 On March 21, 1895 First Church was partially destroyed by fire. 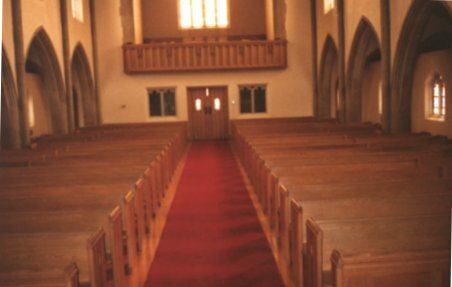 The work of reconstruction was immediately and vigorously undertaken and in December of that year, it was ready for occupancy. 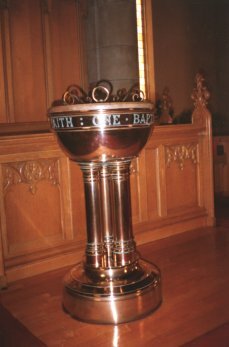 A renovation program was undertaken in 1919, which made it the beautiful place of worship which delighted people for the next 27 years. 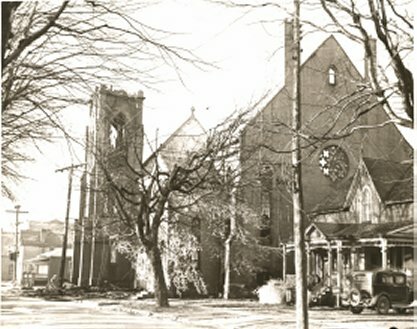 About 10:45 p.m. on Monday, March 11, 1946 First Church was discovered to be on fire. The city Fire Department fought valiantly but finally the bell fell from its high tower with one mourning knell. The bell, which was badly cracked and damaged when it fell from the top of the tower, was melted down and cast into 1500 miniature bells. 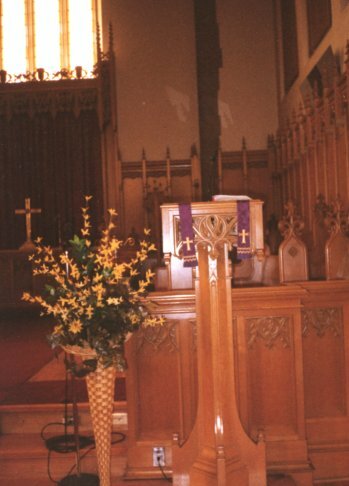 The bells were offered at $3.00 each. Of course there were many who felt the price was too low and were strongly recommending higher sums of anywhere from $5.00 to $25.00. This advice was always respectfully accepted and the suggestion recorded in a small notebook with the name and amount proposed. When this individual was approached about buying a bell, he was reminded of his suggestion and was assessed just that amount. It must be said that in every case the 'victim' came through like a good sport. 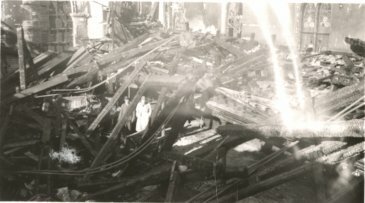 The day after the fire, the Official Board was convened and it was voted to rebuild. The fire was a total loss, with the exception of the brass baptismal font and most of a set of dishes in the old kitchen. The Famous Players Corporation graciously offered the use of the Capitol Theatre, located on Talbot Street, rent and heat free. 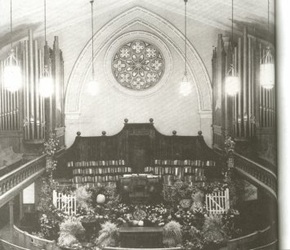 After $800 in decoration the congregation had a presentable church home for two years. When it was decided to re-open the Capitol Theatre, Alma College had just dedicated a new chapel which was made available to the congregation for morning services. On March 5, 1950, almost four years to the day after the disastrous fire, the beautiful stone edifice was dedicated to the glory of God and use of the people by the Moderator of the United Church, the Very Rt. Rev. William Brewing, D.D. With the church formally open and in use, the next project was to pay off the mortgage. 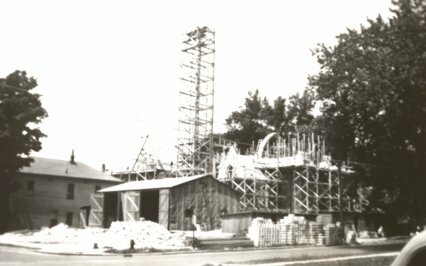 The total indebtedness of $275,000.00 was cleared by the autumn of 1955, and $10,000.00 was already in the bank towards the next project. 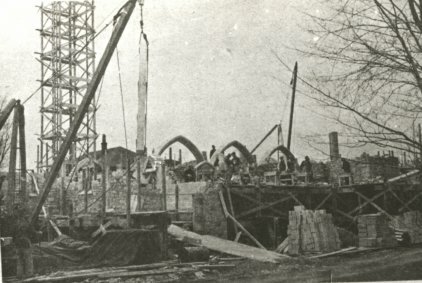 In 1956 the church Board was authorized by the congregation to get construction underway for the first addition which would be the Christian Education Building. 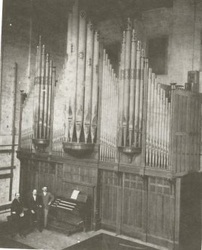 The new section would include a recreation hall, church office, church parlour, and additional Sunday School rooms. The second and final addition of the Christian Education building was completed in the fall of 1962. This was a five room addition constructed over the recreation hall. 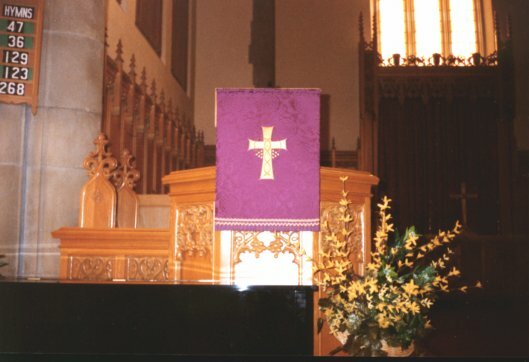 The new church was constructed of Ontario Sandstone and trimmed with Indiana cut stone. The stately Norman Tower with its triple gothic openings and restful louvres and tracery, rises about 80 feet from the ground. 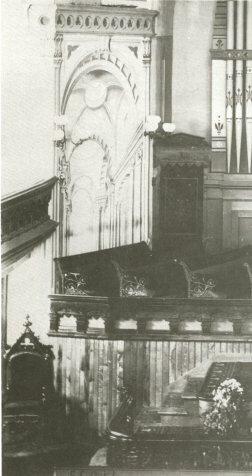 The pew and chancel furniture is of fine grain oak and ash, finished in pleasing light tone and modestly ornamented with carefully selected symbolism. 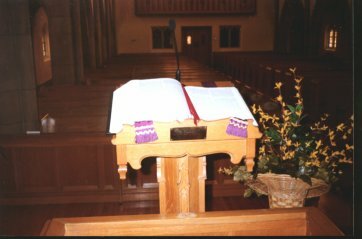 The new church stands in sharp contrast both the simple one room chapel of the early days and the semi-gothic Victorian church totally destroyed by fire. The sanctuary, completed in cathedral style, differs from most other United Churches. 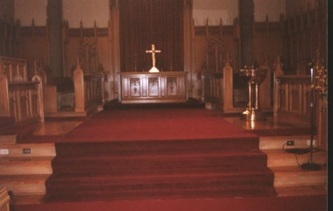 Over the years First Church has undergone many upgrades, such as a new roof, and accessibility lift and new carpeting in the Narthex and Sanctuary. 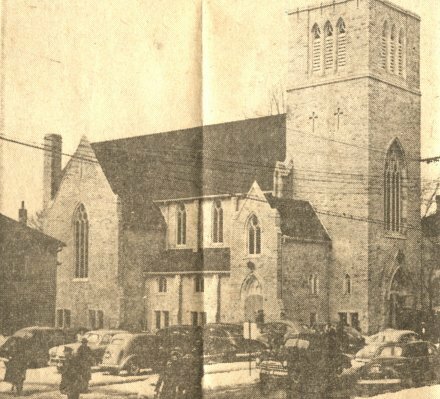 The church has come a long way from the small one room chapel on Stanley Street to the beautiful gothic building that stands today on the corner of Curtis and St. George Streets.